A Santa Claus Christmas Parade! Do you like them? Tell Santa! Today is a big day! It’s Christmas Parade Day! I have been eating extra cookies and mince pies. Mrs. Claus made sure my red Santa suit looks extra spiffy. I have even been saying my “Ho! Ho! Ho!’s”! I want to make sure my belly shakes when I laugh like a bowl full of jelly! Today I am going to be in a Christmas parade. It is the oldest Santa Claus parade of them all. (But it is not as old as I am! 🙂 ). I love a parade. Do you? I really like that I can see so many of my friends. I get to wave to them. I get to talk to them. I get to ride in bright red fire trucks. I get to ride in bright red sports cars. I get to ride in my bright red fire sleigh! I really have a lot of fun! The marching bands play ALL the music I like best: Christmas music! The floats are all so fun and happy! Everybody watching the parade has so much fun, smiling and cheering! I get to be in so many Christmas parades. I wish I could have a parade in every town! Then I could see all my friends. If you can not come to a parade, I hope you will email me to say “Merry Christmas!”. I santa i am talking to my best friend right now.i love the santa parade it was my frist time being there.my little cousin was scared at frist but then she was fine when she saw u.i saw the santa parade in london ontario. I love parades but i have never been to a santa one i wish i could though….. I watch the macy’s Thanksgiving Day parade every year…my favorite part is at the end when you come out on your sleigh…it just kicks off the christmas season with a great start!!! Santa you’re the BEST!!!! I love you!! Thank you for sendingme a letter I hope your elfs have fun on Webkinz and I guessed what their favorite was ………… a reinder ! I have one too ! have a great Christmas! Heyy! I am so excited for christmas. I dont think anyone is mean to me because i stick up for me and my family. But this year has been better! Hey, I ‘m not sure if my friends really like me or not. What should I do? Hi Kallie! I’m sure they do, but you could always just ask them?! Hi Santa I hope the eleves are working hard. HO!HO!HO! HOW ARE YOUR ELEVES DOING? how was your halloween? do you give coal to bad children? if yes why? IMjust making shore. I don’t think you do. i guess that you just say that because you wan’t them to be good. You can read about Halloween at the North Pole here. 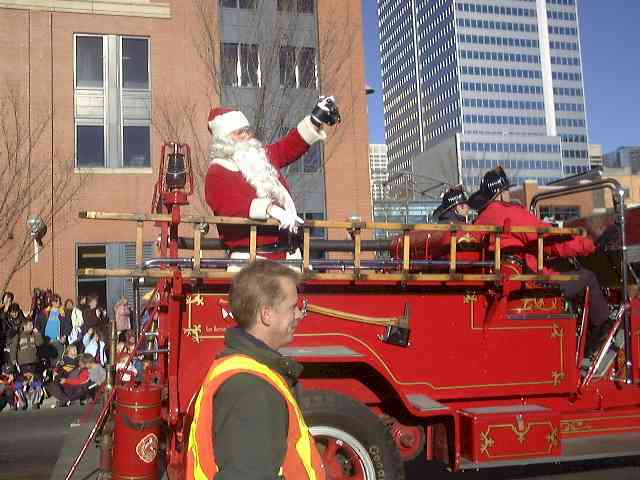 Santa you are so cool to get to ride in a firetruck! Merry christmas! Hope you have a nice one!!!! i love you santa and i can feel that your elfs are at work. I LOVE U SO SO SO MUCH SANTA!!!!!!!!!!!!!!! My fav. part is seeing you, mrs.claus, and the grinch. my parnets don’t belive in you. got any prove? Its a nice idea to participate in a Christmas parade. Of course Santa letters take large part of it while inviting your friends to the party. I love you Santa!!!!!!!!!!!!! I don’t care if people think that your not real, but I think you are!!!!!!! I think your so smart that you whould get 100% on any test in the world!!!!!!!!!!!!! why would you want your belly to shake like a bowl full of jelly? anyways, that’s really funny. hey santa i sent you a letter yesterday. I love you can you please send some cookies from Mrs.Claus’s kitchen. I wrote that in my letter to. All of the nubers were always bissy. I Have tried now 4 times now and all of the numbers do not work. Please pease please help me thank you. Hapy, write us another comment but put your email address in this one. We promise not to share it with anyone. That way we can see if we can help get you in touch with the people who can help kids. All i ask for Christmas this year to those children less fortunate than the rest of us may they have a wonderful and warm christmas. God bless you Santa, and i feel so happy reading about you and all of the wonderful things people say! hi santa i love christmas but people at school are saying mean things and saying that they dont beleive in santa and that only babies do! what should i say to them? Sophie, it is ok if others don’t believe in me. Sometimes when kids and adults get older they lose their spirit of childhood. They even start to think that I don’t exist! Just remember, everyone can have their own opinion (even if it does not happen to be right! :). hi santa i love you very very very very much and the elves and reindeer and your wife. have a very holly jolly Christmas. I really like how you are so kind to all of the children out there!!! I love your sleigh and at Christmas Eve i always look out for you!!!! I hope that you, Mrs Claus and Rudolph and all the reindeers are well and I hope you have a Merry Christmas and a Happy New Year. i have never been to one but my mom and dad said they would take me to the next one. we hope you are taking loads of little sleeps to build up your energy for the big night. dont forget to eat pleanty of spuds and bacon so you will be in the best of health for the coming weeks. I am in the christmas parade this year because i am in the girls scout and last year i saw u u spoke to me. Another good place is this page about bullying. Remember, no one deserves to be bullied. Bullying is not cool! Here in Glen Alvie it has been very cold. I’m in grade 5 and learning long divison. Santa you are so nice Giving to people each and every year. So i am giving a thanks to you santa! the phone numbers for the kids help line didn;t work i still need some one to talk to. have u ever had one million presents? I love love love love love love love love love love love love love love love love love love love love love love love love love love love love love love love love love love love love love love love love love love love love love love love love love love love love love love love love love love love love love love love love love love love love love love love love love love love love love love love love you you you you you you you you you you you santa santa santa santa santa santa!!!!!!!!!!!!!!!!!!!!!!!!!!!!!!!!!!!!!!!!!!!!!!!!!!!!!!!!!!!!!!!!!!!!!!!!!!!!!!!!!!!!!!!!!!!!!!!!!!!!!!!!!!!!!!! santa i just got don tiping you.my mom has ben talking to you.i’m being good. It is not your fault that Michaela says and does things that aren’t nice. No one deserves to be treated like that. If anyone ever tells you they don’t want to be your friend, I want you to politely say to them “If you were a nicer person then maybe I’d want to be your friend.” And then just walk away from them. hope you have a good christmas because we will!! Well my favorite part of a parade is seeing you be all cheerful on the cool firetruck! Santa you so awesome! I’m in 6th grade in Wenatchee But I still Believe in you! I love you!! Ha lol! i can’t wait till christmas this year because i am moving right near christmas! Dear santa thankyou for reading my letter i hoped you enjoyed it. im counting down how many days to christmas. it is me Maya you said the elves wanted me to read your blog.i can’t wait to christmas. santa the jonas family loves you!!!!! Thank you, Santa, for enjoying my letter. I hope your elves have fun playing with their Webkinz online. I also hope you have a good, jolly Christmas. That is so funny Santa! I love jelly and ice cream! I hope you are having a nice Sunday. I love Christmas parades. I will try to find one I can go to, this year. I hope to see you.